Nationwide, lightning strikes about 25 million times each year, and on average, lightning kills about 49 people each year in the U.S. 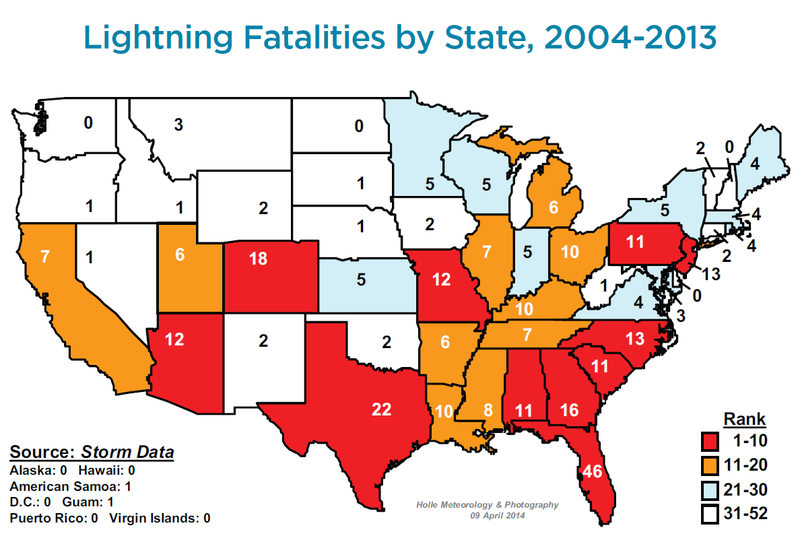 There were 29 lightning fatalities and 182 lightning injuries reported in the U.S. in 2010. Between 2004 and 2013 there were 22 lightning fatalities in Texas, making it the second highest number after Florida, which had 46 fatalities. Parts of southeast Texas average 50 to 60 days with thunderstorms per year, which frequently occur in the late afternoon and early evening hours during summer. The Gulf Coast has more lightning strikes than anywhere else in Texas; however, the cities of Austin and Dallas see a similar number of lightning strikes each year. In the U.S. alone, some estimates put lightning losses at over $2 billion in damages each year. Lightning damage affects both homeowners and business owners. According to the National Lightning Safety Institute, 30 percent of businesses suffer lightning losses, costing the U.S. economy $6-7 billion. Lightning also has the potential to cause devastating fires that completely wipe out homes, businesses, and people who stand in the path of destruction. These days, many communities have emergency warning systems to alert residents about severe storms. Learn about your town’s warning system, and if your town doesn’t have one, talk to your mayor or city councilman. As a homeowner, it’s important to be prepared in your community and in your home so that you can devise an effective storm survival strategy. The first precautionary step you should take to prepare for an oncoming lightning storm or future lightning storms is to secure your home. These are some things that you can do right now to prepare for potential storms. Lightning rods are fixed metal rods or wires that are installed on an exposed part of a building to divert lightning to the ground. Homeowners may want to install these because provide a path of low-resistance from the sky to the ground and protect your home. Contact your local fire department to discuss whether installing lightning rods on your building is a good idea. In your yard, it’s a good idea to trim trees and shrubs to make them more wind resistant. Also, you should secure outdoor objects that could blow away or cause damage. Finally, repair or replace faulty window, doors, or other parts of your home that may not be able to protect you during strong storms. Generally the safest place for you to go during a lightning storm is your own home or a safe building nearby if you are away from home. Postpone any outdoor activities until after the storm has completely ended, because lightning often strikes before rain starts and after it lets up. Unplug all electronic devices at the first indication that a storm is coming. Mobile homes can often blow over during strong winds, so seek a more stable shelter nearby. When a storm starts, shutter your windows if possible, or at least close your blinds or curtains. If you have kids, it’s important to teach them about thunderstorms at a very young age. Although children are often scared of storms, you can explain that storms are a natural part of our planet’s weather...just like sunshine and rain. The National Weather Service offers some educational and fun lightning-related games and activities, including Leon’s Lightning Safety Game, Leon the Lightning Lion coloring book, and FEMA Kids to Kids: Lightning Safety by Sabrina. Science experiments, like “making a thunderstorm in a bottle” are also useful tools to help kids understand why storms occur and alleviate their fears. Consider visiting science museums in your area and when you travel to help your kids understand what causes lightning and thunder. At home, practice storm preparedness strategies a few times per year to remind children of how they should respond when a storm hits. Child psychologists can be effective in treating kids with severe storm anxiety through relaxation therapy, storm reenactment activities, and thought readjustment. Although electronic devices may keep your kids occupied and entertained during a storm, you should prohibit the use of plugged-in electronics when thunder and lightning are in the area. Keep a battery-powered TV or radio handy so that you can use these devices instead and keep your kids safe. Consider playing a few fun card games or board games with your kids during storms while listening to weather updates on the TV or radio. Many pets, especially dogs, are fearful of thunderstorms and begin to panic even before the first bolt of lightning strikes. Find a quiet, safe area in your home that your pet will feel comfortable in during storms. You should never force your pet to stay in a designated area during a storm, but make it as inviting and comfortable as you can. If your pet is especially prone to anxiety during storms, talk to your veterinarian about potential solutions. Prescription medication or herbal remedies may be recommended to ease your pet’s worries during thunder and lightning. Anti-anxiety medication can be taken orally and mixed with food. And finally, make sure that your pet has a microchip in the unlikely event that he escapes during the chaos of a storm. Make sure to bring all pets indoors and into a safe place, even dogs that spend most of their time out in the yard. If your pet is afraid of storms, use a ThunderShirt or swaddle him/her in a blanket. Comfortable, close-fitting garments can create a calming effect and reduce anxiety for many pets. Gentle grooming and soft music can also calm pets during storms, and many pets feel more comfortable in a dark interior room away from windows. Seniors, especially those with limited mobility, should prepare a first aid kit and storm emergency kit and store them in a place that’s easy to reach and remember. They should also write down a list of emergency contact numbers, including those of adult children, doctors, and neighbors. Even if you know commonly used numbers by heart, they can come in handy when you’re feeling panicked or caught off-guard during a storm. Seniors should avoid leaving the home during lightning storms and communicate with a trusted network of friends and family to inform of their safety. Work with seniors to plan multiple evacuation routes and keep extra medical supplies on hand in case they are unable to leave the house for a few days. These some foods that don’t require cooking that seniors should stock their pantry with to prepare for storms. As a senior citizen, you’ve likely seen lots of storms over the years, but it’s still important to take necessary precautions to stay safe. In particular, don’t take a bath, shower, or do any household chores that involve plumbing during a storm, such as washing dishes. Seniors should also avoid using corded telephones during storms in case the storm has caused downed power lines in the vicinity. If you are responsible for caring for a senior citizen, do your best to keep him/her calm and relaxed during the storm. Make sure that seniors stay away from doors and windows during a storm and avoid using plugged-in electronic devices as much as possible. If you are a caregiver that lives a significant distance away from your senior, you may feel helpless to protect her during a bad storm. Resist the urge to go out into the storm yourself to be with her unless it is an emergency that requires immediate attention. Similarly, people with disabilities should be taught emergency preparedness strategies and practice “storm drills” on a regular basis. If people with disabilities understand the routine for staying safe during storms, they will be more likely to remain calm and take effective action when lightning begins to strike. Caretakers of the disabled should remain calm and ensure that the disabled person stays indoors and away from windows and doors. Ensure that disabled people stay indoors for at least 30 minutes after the last boom of thunder before resuming normal outdoor activities. Books, games, and craft activities can keep everyone occupied and entertained while a storm is happening. These guidelines apply for caretakers who are responsible for people with physical disabilities, mobility issues, Downs Syndrome, Alzheimer’s, autism, and other mental disorders. If you work in an environment that cares for multiple people with disabilities, employ the “buddy system” and have residents pair up to assist each other. It can also be helpful for people with disabilities to wear a medical alert tag or bracelet that identifies their disability and vital medical information in case they become lost or separated. Where do Most Strikes Occur? If no building shelter is available in your near vicinity, seek shelter in a hard-top vehicle. Although cars are far less safe than buildings, they are safer places to be than outside in the open during a lightning storm. The metal frame of a hard-top vehicle can provide you with some protection. Just don’t lean against or touch any metal parts of the car while sitting inside. If you are in a forest during a lightning storm, look for a low-lying area with plenty of plant growth and small shrubs. If you are in the wilderness hiking, biking or camping and there are no buildings or vehicles available, always look for the lowest place possible to seek shelter. However, be careful of flash floods if the thunderstorm is accompanied by heavy rain. Never wait out a thunderstorm on a boat or in the water, as these are very common places for lightning strikes. Lightning strikes are incredibly serious and kill about 10% of victims. The other 90% of strike victims are often left with severe burns and disabilities. If the victim is not breathing or responsive, someone who is qualified to perform CPR should do so as soon as possible. An automatic external defibrillator can also come in handy during these circumstances. Children, the disabled, and the elderly may require extra assistance after storms strike, so be mindful of others and help as much as you safely can. Homeowners should approach outdoor areas affected by a storm after it ends so you don’t put yourself at risk of injury. Since lightning is often accompanied by heavy rains, be wary of flooded roads and underpasses. Listen to local news and weather reports to assess the damage, and steer clear of damaged areas. Stay away from downed power lines, but call the issue into the local authorities to report them for cleanup. In Austin, call 311 to report flooding on your property, storm damaged trees and damaged overhead electrical lines. According to a City of Austin update after Memorial Day storms, Austin Energy responded to outages impacting 30,000 customers due to severe weather and restored all service following 37 pole replacements and 147 downed wires. Unfortunately, sometimes lightning disasters leave residents without basic needs like shelter, food, and water. Here are some emergency housing and shelter resources around in Austin to keep in mind if catastrophe strikes your household. Similarly, Dallas has a 311 city request service and a 311 website where you can submit a wide variety of cleanup requests. The City of Dallas Office of Emergency Management is responsible for releasing public warnings of potential and imminent disaster, and providing disaster-related safety information. These are some resources for emergency shelters and disaster relief services in Dallas. If your storm-related disaster has left you in need of housing, transportation, medical, or personal property assistance, there are resources available to you. You can apply for disaster assistance related to your home or business destroyed by the storm. These are the important contacts that all Texans should know.